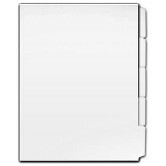 If you are in need of printable copier tabs for your office, then we can accommodate. 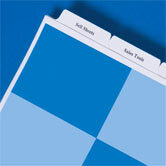 Copier tabs are unprinted, blank index tabs that can be tagged using a laser printer or copier machine. ADSS specializes in blank index copy tabs that you can print on. All Copier Tabs are available 3 hole punched. We also provide unpunched printable tabs if you desire to punch your own. We sell by the case, where 90# index tabs are standard and 110# are available on request. If you are a law office, then we can provide legal tabs as well. Advanced Document Systems & Supply can also provide custom copier tabs printed to your exact specifications! 1/5 cut single reverse printable copier tabs are the most commonly used in the market today. These are sometimes referred to as reverse collated copier tabs or SRC copier tabs. They come in many different cuts and are packaged in the reverse of how they will appear in your documents. 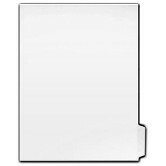 1/5 cut double reverse printable copier tabs are the second most used in the market. These tabs can also go by the name 5090 copier tabs. 1/5 cut uncollated printable copier tabs are great if you don't have a high-end copier machine or laser printer that can handle multiple sets of paper. These come as only one tab position and can be referred to as single position tabs. Advanced Document System and Supply is here to provide you with quality products at affordable prices from single reverse, to double reverse, or uncollated copier tabs. Remember, we can also provide you with custom copier tabs that fit your exact needs! If you have any questions, please call one of our trained product specialists today! 1-800-808-2377.